The dough is the challenge in this dish. Pasta dough must be very dry. 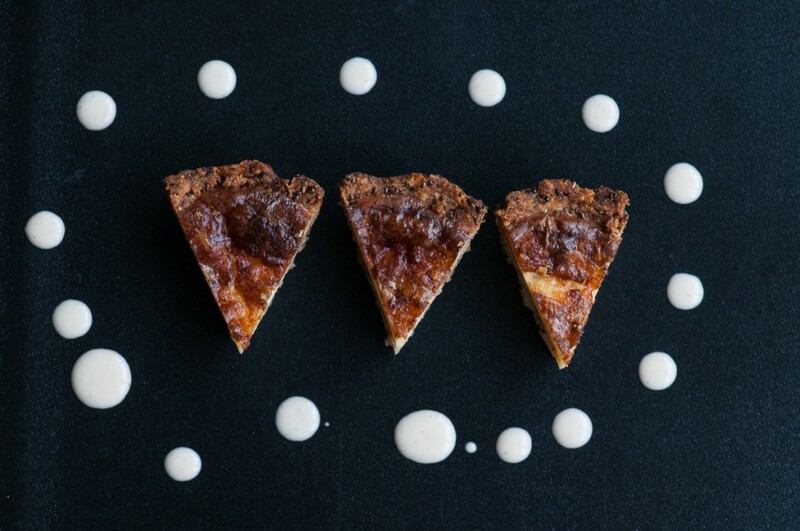 The balance between dry dough and crumbles is fine but not impossible. This recipe has enough “binders” to keep the dough hold together which can otherwise be a problem. The best would be to use a pasta machine, but you can easily roll this dough by hand with a rolling pin. This recipe can also be used for pasta noodles or lasagna. 1. In a bowl, combine the ingredients for the filling and set aside. 1. Place the psyllium in the water for a few minutes to swell. Then add to the other ingredients. 2. In a food processor, combine all the ingredients, except the 1-3 tbsp water, for the dough. 3. Let run until well combined, then add the water drop by drop and stop as soon as the dough forms a ball. Sometimes, depending on your type of food processor, the dough will stay in crumbles. Then press the crumbles into a ball by hand. The dough should be dry, not wet. 4. Take a piece of dough and roll out (with a rolling pin) into a rectangle. Run though a pasta sheet maker on the largest setting. Fold 2 flaps on top (so that you have a third left of the size of your rectangle) then run through the pasta maker again. Keep on doing this until you get rid of any tears or holes. Then you can go for a smaller setting. Then repeat and do one smaller setting still. If you a working by hand with a rolling pin only, follow the same folding steps and stop when the sheet feels elastic and is thin enough for a ravioli. 5. You now have your first ravioli sheet. Dust one side with rice flour and place it flour side down. Make another sheet of ravioli which will soon go on top. 6. 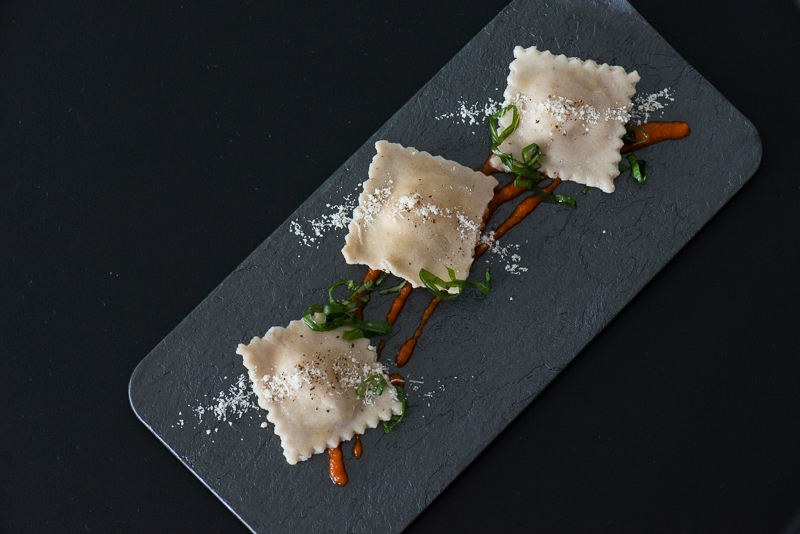 Using a ravioli shape (or not), place small fillings on top of the sheet. 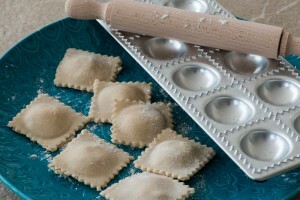 Cover with another sheet and, if using a ravioli shape (as in the photo) then separate the raviolis with a rolling pin, otherwise cut them into raviolis with a knife. 7. Make all the raviolis you need. 8. Cook in a large pan of boiling water for 2-3 minutes. 1. Combine all ingredients for the sauce and simmer a few minutes in a pan. Serve immediately with grated parmesan cheese and basel. Melt the Camembert in a microwave. 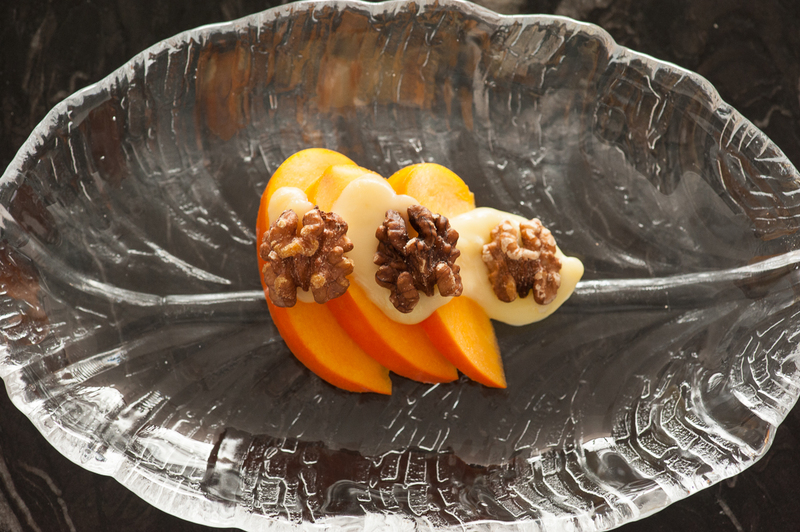 Arrange the cut up persimmons on a serving plate. 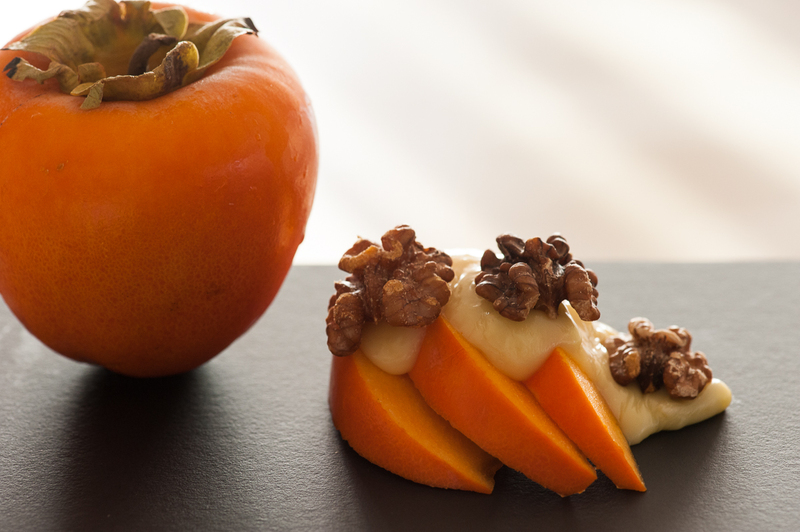 Place the walnuts on top. A wonderful, classic dish to be served at the end of the meal. Quick and easy to make. 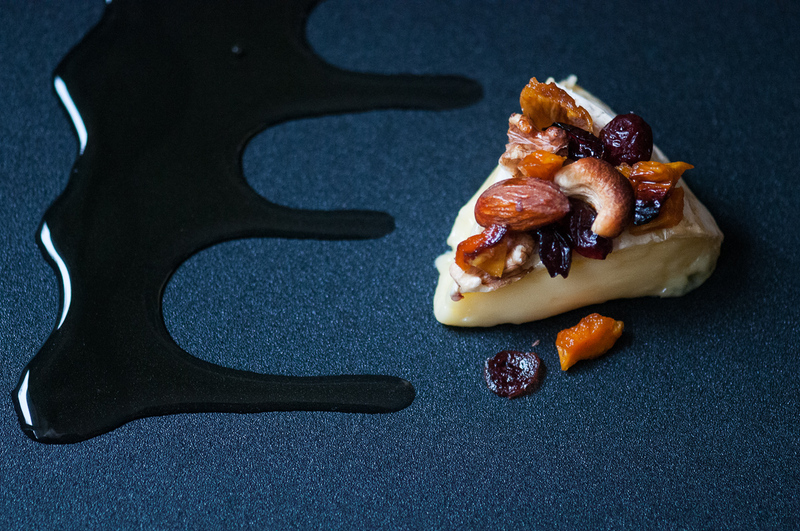 Place Brie on a baking sheet, sprinkle with nuts and dried fruits and drizzle a bit of honey on top. Bake in oven for about 20 minutes or more. The cheese needs to be very soft when pressing the middle. Cut and serve at the table, possibly with some extra honey on the plates. This is an absolutely amazing pie! It may not look the part but it is one of my very best dishes. Lots of cheese and butter and with a few drops of Cognac to give the pie a little sharpness in the taste. Hope you will enjoy this as much as my guests and myself usually do. Combine the ingredients for the crust. Let stand for 20 minutes to let the Chia seeds gel. Press into one large pie dish. Or use 4 individual pie molds. Place in a freezer for 15 minutes or refrigerate for 30 minutes. Bake the pie crust in the oven for about 15 minutes. Mix the filling and pour into the pre-baked crust. Bake in the oven for another 20-25 minutes. Most of this starter can be prepared a day ahead. 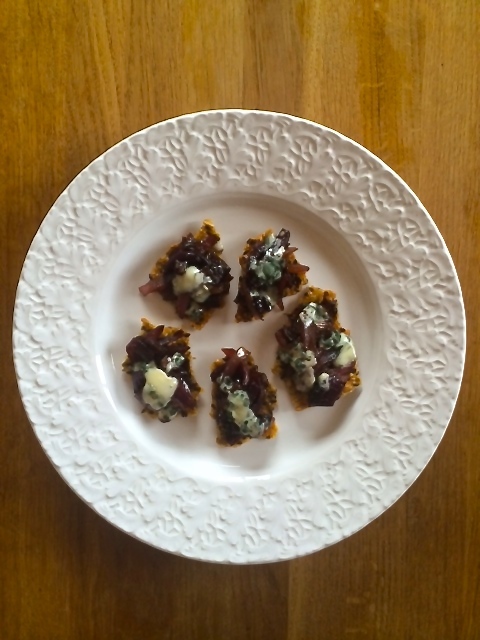 Serve it as a starter or mingling food, depending on your mood. 1. Start off making the crackers: Heat the oven to 150 degrees. Mix the seeds with cornflour. Add boiling water and olive oil and mix well. Spread out on a baking sheet on a baking tray and make sure to spread it out to make it as thin as possible. Sprinkle sea salt on top. Bake in the oven for 1 hour. 2. Now prepare the glazed onions: Fry the onions in a generous amount of oil in a pan on medium heat for about 15 minutes to soften the onion without burning it. Add the vinegar and sugar, mix and fry for another 5 minutes. Season with salt and pepper. Until here you can prepare a day ahead. 3. On the day of serving: Heat the oven to 225 degrees. Break the cracker into pieces. Divide onion mixture over the crackers and add pieces of cheese on top of the onion. 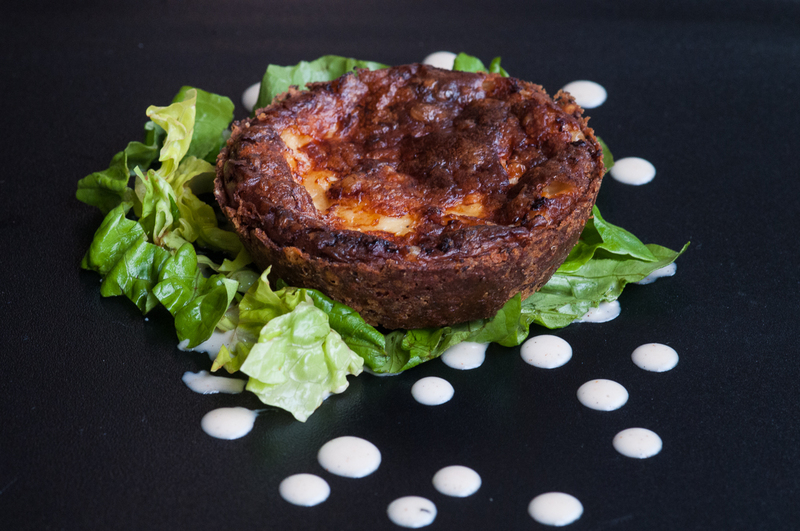 Gratinate in the oven for 10-15 minutes. Serve as it is or with a salad.